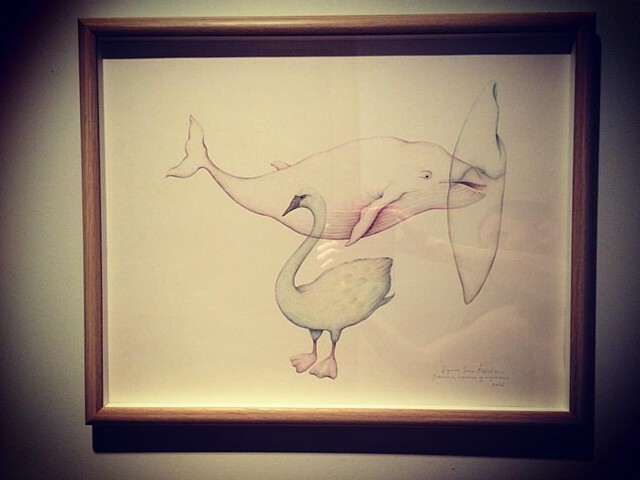 Sigurrós Svava Ólafsdóttir - The Swan, The Whale and The Canine Tooth. The Swan, The Whale and The Canine Tooth. The swan, tha whale and the canine tooth has been in the making since fall 2016. The elements in the drawing have been a fascination of mine for years now and they have come to me through time. I collect elements to show in my drawings and I build a connection or a relationship between them, similar to Gabriel Orozco's ideology where he believes beauty is not plainly beauty thus it exists when we make a connection between objects, often different objects. In my work I have made drawings and installations where I lay together objects from different directions and these days I am more into focusing mainly on drawing natural beings as they appear in nature but focusing on porportions, for example in the drawing The Swan, the Whale and The Canine Tooth I show the elements in the ,,wrong'' porportions.